This video would be more suited to environmental studies, political science, media studies or the like. Video could be used as a wrap-up, after students have a handle on the science, in order to jump to questions about how confusion on the science has moved into mainstream culture. A good video to introduce the effects of increasing global temperatures as well as demonstrating the way science is done - scientists using data, making predictions, and then testing the predictions over time. The key content of this video is the evolution of the acceptance of climate science. Interviews and other clips consider the conservative predictions of the IPCC 5th report, as in a previous report underestimating Arctic sea ice melt; the long-standing views of scientists with predictions as far back as the 1960s, which have come to actuality; and the importance of the science in the report. Video content is interdisciplinary and covers science and the history of climate science. Points out how older models have been proven to be correct 25 years later. Video would be good for a class looking at global warming, human caused climate change, and how the early predictions of global warming have held up. 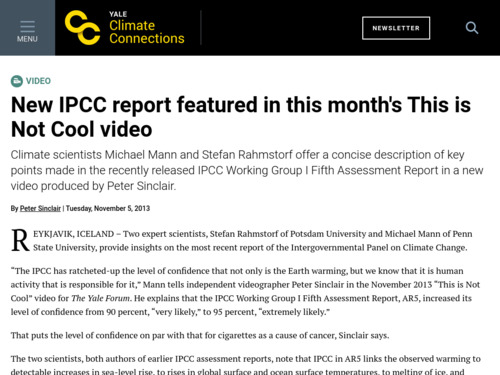 A good review of the history of the IPCC and the findings of the 5th report. Covers both science, policy, and public opinion. Image is somewhat grainy in full-screen mode.